A disturbing lack of faith? Star Wars proprietor Disney has ditched the forthcoming Attack Squadrons video game, in order to concentrate on other gaming projects based on the movie franchise. Announced in December, the Attack Squadrons game was supposed to be a free-to-play, multiplayer, browser-based title that allowed up to 16 players to engage in space dogfights. 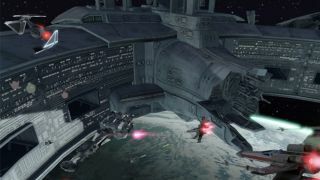 Developed by Area 52 studios, it had offered gamers the chance to command, customise and upgrade iconic vessels like the X-Wing and Tie Fighter and take them into battle. Despite that all sounding somewhat intriguing, Disney has decided to scrap the project following a period of private beta testing. On the game's Facebook page Disney announced: "We want to thank all of the fans who participated in the closed beta of Star Wars: Attack Squadrons. "After much consideration, we have decided to cease development so that we can focus on other Star Wars game experiences." P.S. We're sorry if we scared you with the first five words of the headline.